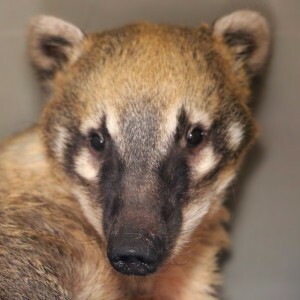 Coatis, or coatimundi, are members of the raccoon family and are native to South America, Central America, and SW North America. Coatis are about the size of a large house cat with incredibly long, nonretractable claws and canine teeth. They are also double-jointed in their ankles, allowing them to walk down trees head-first. Their snouts are long and pig-like. Their nose is very flexible, it can be rotated up to 60 degrees in any direction. Coatis are intelligent, active, and curious animals. They can also be fierce fighters and highly possessive. They are omnivores, eating bugs, spiders, lizards, rodents, and eggs along with fruits and vegetables. In the wild female coatis often live in bands or groups, while adult males are often solitary.